HP has announced today updates to its Elitebook and Zbook lines, with an aim to 'bring premium experiences and features to the mainstream'. Ultimately, it comes down to a mobile workforce, which is a key aspect to HP's latest marketing push and updates. The 800 G5 series is a mid-level commercial laptop resting below the flagship premium design of the Elitebook 100 series. HPs goals with this generational update are to bring down features of that premium design to the mainstream and the majority of users. To that end, the Elitebook 800 G5 series was redesigned using an all-aluminum chassis with a lighter color, a narrow border ultrabright IPS display (adapt to changing light conditions through ambient temperature sensors), as well as performance bumps through using the latest 8th generation Intel Core processors. 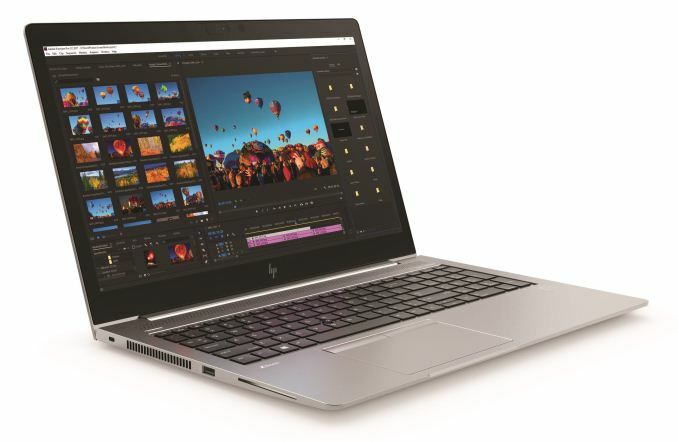 HP claims that the new Elitebook 800 G5 series is said to the worlds thinnest 14” notebook with discrete graphics (AMD Radeon RX540). Even with the discrete GPU and 8th Generation Intel Core processor, the battery life is listed as running for up to 14 hours, and supports HP Fast Charge, which claims to provide 50% charge in around 30 minutes. The Elitebook 800 G5 series is also focused on I/O - according to HP, ITDMs were requesting a lot of IO capabilities, so these models use a diverse set including USB Type-C connections with TB3 support, an ultraslim dock connector (dual docking capability), RJ-45, HDMI, cards readers, etc. The Elitebook 800 G5 series adds a third microphone, a 'world-facing' implementation, located on the back of the monitor panel. This microphone can function in two ways: first in individual mode will be used as a noise canceling device; second, in conference mode, means it can be used as a standard microphone to pick up voices, etc. The device can also be used as a full function speakerphone, to text and answer calls (HP Phonewise), and is Skype Business certified including shortcut keys for present, answer, and hang-up functions. On the security and manageability side, HP trickled down its suite of security functions to the 800 series. Features such as HP Sure Start (BIOS recovery/healing – powered by endpoint security controller), HP Sure Run (maintains and protects company firewall and AC), HP Sure Recover (quick and easy reimage of device), and HP Sure Click (protects against malware/ransomware through browser), and HP Sure View Gen 2 (for screen privacy, reduces viewing angle to ~35°) all make their way to this series. In addition, the 800 G5 series also includes biometric multi-factor authentication through Windows Hello and a fingerprint sensor. And for those who cover their cameras up with post-it notes, the new Elitebook includes an integrated shutter users can slide over covering the camera ensuring privacy. All Elitebook models will be available in February 2018. With the 830 G5 (13") starting at 1049, the 840 G5 (14") at $1029, and the 850 G5 at $1039. Dimensions 830 - 12.22" x 9.03" x 0.7"
840 - 12.84" x 9.22" x 0.7"
850 - 14.6" x 9.91" x 0.72"
The HP ZBook 14u/15u G5 is the next product line in the Zbook family to get an upgrade. The ZBook 14u reduces its thickiness by 28% compared to the last generation, while both the 14u and 15u lines get an upgrade to 8th Generation Intel Core processors (up to quad core). Updates also include Radeon Pro discrete graphics, and high speed PCIe SSD options for fast storage. HP has also put the 14u/15u through MIL-STD 810G testing including additional testing for bench handling and crash hazard shock. Outside of the performance and durability, HPs aimed to deliver premium features to the mainstream in the Zbook as well. The chassis of the HP Zbook 14u/15u uses a CNC machined LCD cover along with an aluminum keyboard deck, which HP claims gives a solid fit and finish that was selected for both aesthetics, and durability. It comes in a silver color with different shades on the chassis, keyboard deck, and touchpad. For specifications, these new models will also Intel 8th Generation processors along with Radeon Pro Graphics. For storage, the Zbook 14u/15u G5 will use the HP Z Turbo drive PCIe SSD with capacities ranging from 256GB to 2TB. It is also the first workstation which uses the integrated privacy screen using HPs Sure View Gen 2 technology. 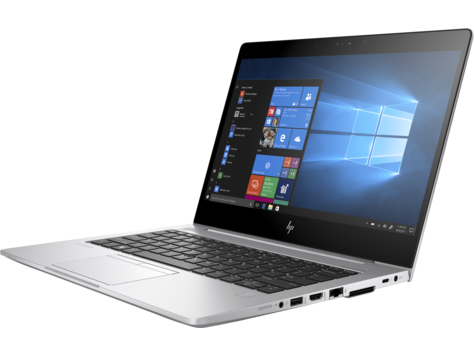 These, like the Elitebook above, are also mindful of security and use the Sure Start, Sure Recover, and Sure Click features from HP. All ZBook models will be available in February 2018. I don't see the slightest advantage over the AMD Ryzen based HP x360. the x360, in both Intel and Amd versions are much cheaper models and fail most notably in having batteries that are only half the size of the x800, and in cheaper models are crippled by spinning rust instead of an SSD. The 15" x360's also about pound heavier than the 15" x800 (I'd assume the same is true for the 14 but don't have numbers in front of me). I can't help but wonder if the Elitebook models with a discrete RX 540 wouldn't be better served with a Ryzen 7 2700U with 25W cTDP for 95% of the people. And it should be cheaper to HP itself, since a Raven Ridge single SoC should be substantially cheaper to implement in a PCB than Intel's rather large Kaby Lake R (APU + chipset) package + discrete GPU + GDDR5. Even more considering how these laptops are all coming with DDR4-2400 which should put the Vega 10 in a good light. And if they play, the most they will do will be at mobas which the 2700U is well suited for. There's no point for intel 4coreHT when Ryzen mobile exist, absolutely no need for low end dgpu. As I say always, AMD needs to give the boot to the OEM's and build their own mobile ecosystem with quality build products.